Stockholmskällan in use on the streets of Stockholm 2017. On mobile screen, the surroundings in 1902. What happened in the streets of Stockholm 50, 100 or 700 years ago? The answer is in your smartphone. 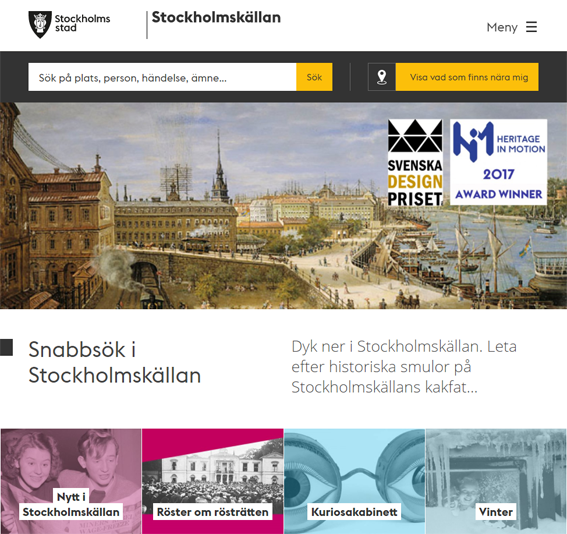 Stockholmskällan is a website that enables you to walk in the footsteps of your predecessors, and to see the traces of history in letters, photos, police reports, maps, film, music, paintings and tips of literature – all geo-tagged and marked out on present day as well as historical maps. 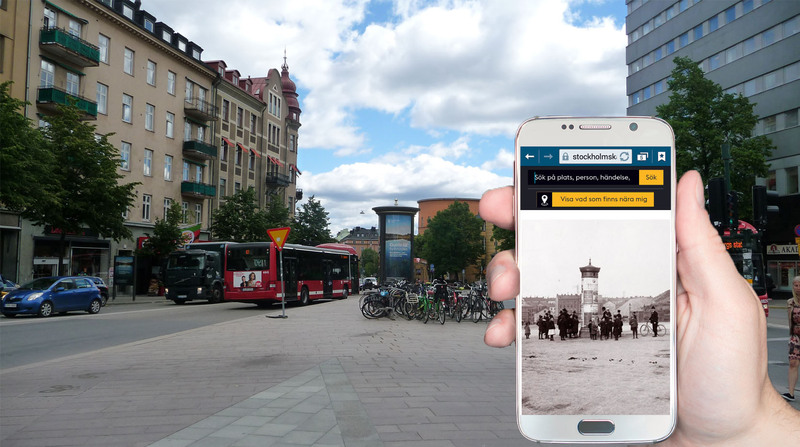 Stockholmskällan tells the history of the City and its citizens through texts, sound clips and pictures. The combination of different types of artefacts clearly shows how Stockholm evolves – the city has been constantly growing from migration during more than 800 years. Stockholmskällan is a cooperation between the Stockholm City Museum, the Stockholm City Archive, the Stockholm City Library and the City of Stockholm Administration of Education. The aim is to enable digitised historical artefacts to the public in general, and especially to schools in order to make it easier to use primary sources when teaching history. At present the database holds more than 30.000 individual posts. Through Stockholmskällan these posts get visible and usable: In one year the website has about 500.000 individual visitors. Stockholmskällan has approximately 12.000 followers on Facebook, 10.000 on Instagram and 2.500 on Twitter. This responsive website was launched in April 2017. The development work is ongoing, but the project of rebuilding the site closed in August 2017. 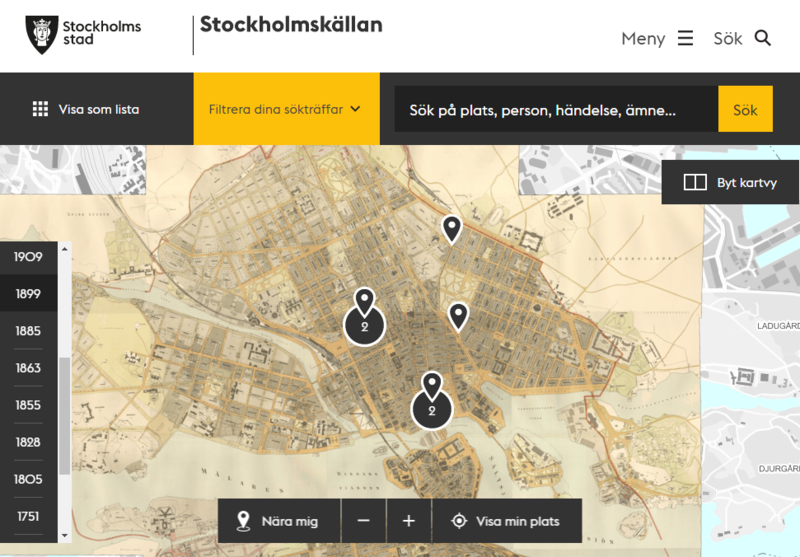 Stockholmskällan’s landing page, with search bar and easy access to search on map for geo tagged material. The aim of stockholmskallan.se – Stockholmskällan – is to add on to the general history as it is presented in most history books, by making available some of the specific, micro level stories and fragments that together form the bigger picture, the general history. 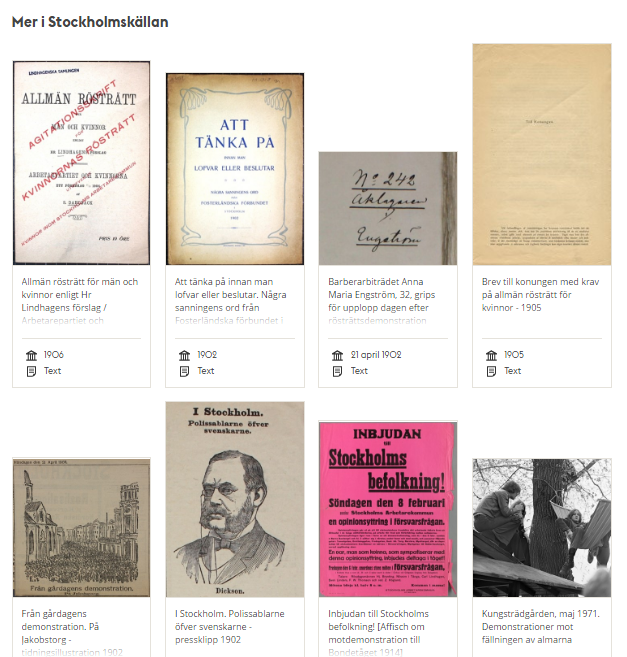 In Stockholmskällan, the history books’ general history at macro level meet the micro level stories through a combination of texts, photographs, art work, maps and other types of digitised historical primary sources. Stockholmskällan, with its 30.000 historical primary sources, does not claim nor intend to provide a full coverage of Stockholm´s history. However, through the documents and pictures in the database, it is possible to add specific details to the greater, general story. Listening to the many voices of everyday life experiences in past times through texts, pictures, music or documented artefacts bring history closer to us. Life comes buzzeling out of the archives! For example: In history books the process of turning Sweden into a democratic society is most often presented simply as a timeline with a fairly short list of dates: The establishment of a two chamber parliament in 1866, the mass strike and the general suffrage for men in 1909, and the general and equal suffrage for both women and men in 1919. Short and concise, this gives an overview of the milestones of the development, but not much information about the people, activities, thoughts, choices and whereabouts that formed that process. Through Stockholmskällan, the micro level stories meet the general history at macro level, thus contributing to a greater historical understanding. We simply get closer to the actual historical conditions and realities if we also take part of some of the specific details in history. There are newspaper reports on mass demonstration for general suffrage in Stockholm in April 1902; police reports on arrested supporters of the vote days after, containing quotes of private citizens who had this struggle as part of their own reality; a pamphlet presenting arguments in favour of the reforms and another pamphlet arguing against, just to mention a few examples. These are fragments of history, remains of the process of developing democracy in Sweden. Specific examples like these are often left out when telling the general story but a valuable complement to the time line summary of democratic development mentioned above. 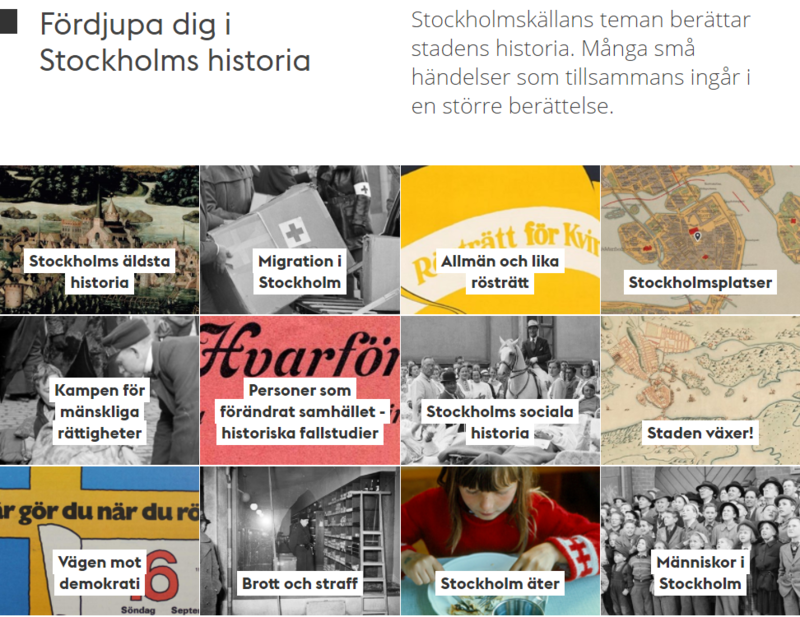 Historical primary sources, available through Stockholmskällan, do contribute to that general story, adding on information about the process behind the stops on a timeline. The primary sources give us a sneak peek into the historic reality. 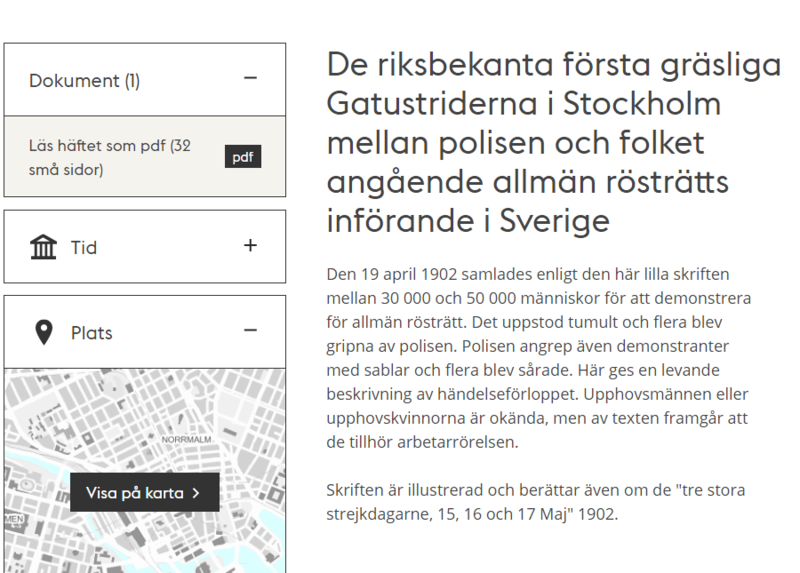 There are different ways for the user to enter the Stockholmskällan database with historical primary sources. The most direct way is to type a simple search word in the search bar on the landing page. The list of hits presents each post in the database with a picture and meta text telling what kind of material it is (photo, text, art work etc. ), historical date and headline description of each material. A click on a post in the hit list leads to a post description page where each material is presented individually. Each primary source in database is presented individually, on a separate post page. 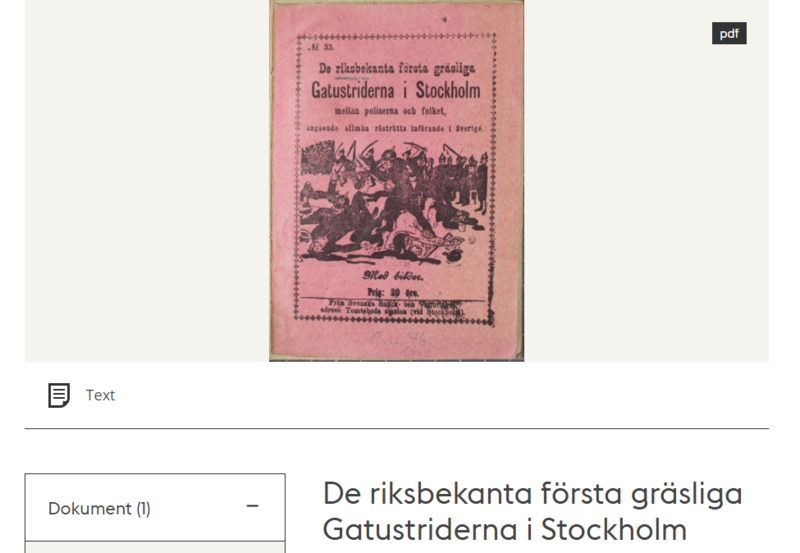 Here, a pamphlet on suffrage demonstrations in Stockholm 1902. To each post metadata and descriptive texts are presented. To each post, the user i presented to similar and related material, to allow further findings in the database. In the database, each material is tagged with key words, described in headline and in most cases also a written presentation where the material is put into context. To each post there is also geographical data where coordinates are given, thus making it possible to point out the origin of the material on a map of the city. In the case of the suffrage pamphlet describing the violent demonstrations for suffrage of April 1902, places in the city where the speeches, clashes and confrontations took place are marked out when choosing “Spot/View on map” (Plats/Visa på karta). 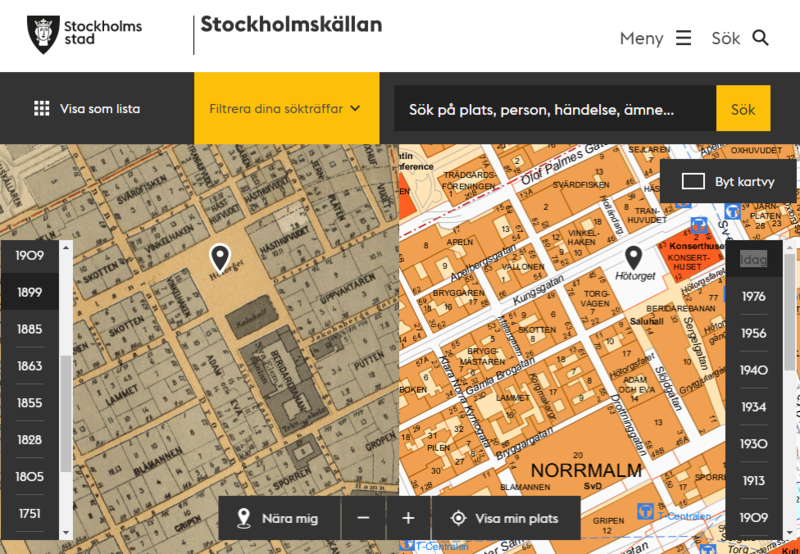 On the map viewer page, you can change the map from the present to a historical map of Stockholm. It is also possible to place two maps parallel to each other, to compare the constitution of the city over time. Sites mentioned in the pamphlet on suffrage demonstrations in Stockholm marked out on a map from 1899. It is possible to search the database directly in the historical map view, either by entering a search word in the search bar or by ticking “Choose spot – Own choice” (Välj plats – Välj själv). When in Stockholm, “Close to me” (Nära mig) shows all geo tagged artefacts in the database within a radius of approximately 200 metres from the device used. This way, the user can follow traces of history directly on the smartphone screen, while walking the streets. The map tool allowes the user to se and compare maps from different times, in order to visualize changes in the city. Another way of entering the database is via ”Themes” (teman). These articles are put together by the editorial staff. In the themes, primary sources that relate to the same topic are clustered and a wider context described and explained to the user. Different sources help complete the story and contribute to the bigger picture. Photos, art work, drawings, maps, text, sound and moving picture work complementarily and together help forming themes such as “Stockholm’s eldest history” (Stockholms äldsta historia) and “The road towards democracy” (Vägen mot demokrati). There is a section of the website called “Stockholmskällan in school” (Stockholmskällan i skolan), where the editorial staff tip teachers of tasks or ways of working with the material with their pupils. These pages are divided after age groups. At present we offer circa 30 prepared tasks for ages 10-19 in the school subjects History, Swedish and Arts. Each task answers to a set of objectives stipulated by subject curricula. The selection of material in the database follow the outlines of national curricula. The actual selection itself is then performed by the expert staff of the institutions respectively. All members of the editorial staff have their professional background either in school as teachers, as museum educators, or in computer/technical engineering. The combination of backgrounds and expertise amongst the editorial staff makes possible to not only serve schools with material for consuming history and historic artefacts, but potentially also to act and interact with it.